Small aperture remodel housing for accent and task lighting. Using twist and lock JDR 50W lamps. Integral thermal protector guard againt misuse of insulation materials and improper lamping. 5 1/2" Height allows use In 2"X6" Joist construction. Unit slips through 3" ceiling opening. 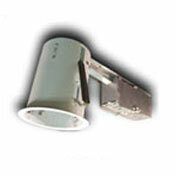 Four remodel Clips secure housing and accommodate various cellling thickness.